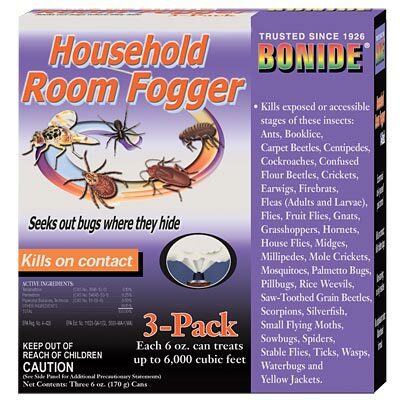 Rid your home, garage, or other infested area of annoying insects with this pack of three Bonide Household Room Foggers. This water-based fogger seeks out bugs and hidden insects such as ants, cockroaches, crickets, fruit flies, hornets, house flies, mosquitos, silverfish, spiders, ticks, wasps, waterbugs, and yellow jackets and kills them on contact. After evacuating all humans and pets from the building and preparing the desired location for treatment, simply place the fogger on a protected surface and press the thumb tab to start the fogging action. After four hours, open all outside doors and windows to allow ventilation for an additional hour before reoccupying. Each 6 ounce can will treat up to 6,000 cubic feet or an average room size of 30' x 25'. Repeat room fogger spraying in two weeks or as necessary for maximum protection. Protect your family and pets from infestations of household insects with this Household Room Fogger. Note: This case pack includes 4 of the Bonide Household Room Fogger 3 Packs.